At four weeks old, our baby girl, Elyse, was diagnosed with PHACE Syndrome. This uncommon condition wasn't even known until 1996 when Dr. Ilona J. Frieden, director of Pediatric Dermatology at UCSF Children's Hospital, and her colleagues first used the acronym PHACE to describe it. Children with PHACE Syndrome mainly have one thing in common, a large facial hemangioma or benign tumor sometimes known as a strawberry birthmark. Other symptoms vary in each child. Some children have more life threatening symptoms, while others just have mild symptoms. In Elyse's case, she had life threatening symptoms that required her to be hospitalized most of her first year and receive home nursing care. When Elyse was diagnosed, there were only 200 reported cases of PHACE. There are no known causes and it is not hereditary. This condition is also more common in girls than in boys. It is important that a child suspected to have PHACE be evaluated by a multidisciplinary vascular anomalies team that includes pediatric dermatology, cardiology and ophthalmology. Testing will include a head and chest MRI/MRA, and an echocardiogram of the heart. When I was pregnant with Elyse, there were no warning signals, and my pregnancy was completely normal. We were expecting a little girl and couldn't have been happier. I had all these plans in my mind, what I would be doing once she arrived. I was going to stay home for 16 weeks after she was born. I was going to breastfeed her, something that I couldn't do with my first child. But then at 36 weeks of my pregnancy, I started to feel ill. My blood pressure was a little high and I was admitted for overnight observation. It was then decided that they would induce me because of my family history of preeclampsia. Elyse was perfect when she arrived. Yet the next day, a slight heart murmur was detected. Four days later, she was in the NICU in critical condition. That's when our lives turned upside down. To begin with, Elyse required two heart surgeries, one when she was two weeks old and the second at three months old. She was diagnosed with a Double Aortic Arch with Coarctation, Ventricular Septal Defect (VSD), Atrial Septal Defect (ASD), Patent Foramen Ovale (PFO) and Patent Ductus Arteriosus (PDA). Her first surgery involved closing the PFO and resectioning the aorta with graft placements. For her second surgery, they fixed continuing narrowing of her aorta, closed the VSD, and took off the pulmonary artery bands that were also placed during her first surgery to reduce the blood flow when she still had the VSD. At four weeks old, right after she was discharged from the first surgery, Elyse began to have internal bleeding. By the third day, her diapers were full of blood and that led us back to the PICU. That's when internal hemangiomas were discovered in her GI tract. I was told that they were like a mass of thin hair-like vessels. The plan of treatment was steroids, which worked within a week, but she still required several blood transfusions to keep her hemoglobin up. When she was admitted, she was extremely pale and had no color. The doctors were amazed at how stable her vitals were. Her hemoglobin was at a four when it should have been at 15. 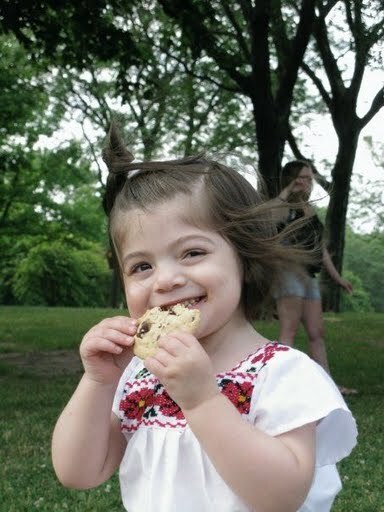 After the hemangiomas were detected, the PICU doctors decided to give Elyse a head CT scan to rule out PHACE Syndrome. She already had the heart problems and hemangiomas, and now they wanted to see how her brain looked. The results included an isolated left subclavian artery originating from ductus arteriosus; a hypoplastic internal carotid artery, and a tortuous posterior cerebellar artery. It was also discovered that Elyse had suffered a prenatal stoke in one very small area. Right after all of this was seen, the neurologist and dermatologist gave us the diagnosis of PHACE Syndrome. I'll be honest. At first, we didn't do much research. I remember trying to look PHACE up once, but there wasn't much information. I couldn't get myself to focus on this when we were more worried about getting her bleeding to stop. It wasn't until after the second heart surgery that we really started to seek out information. Initially, the second surgery was supposed to be simple. Now with all the blood loss and because she was very tiny, they really wanted to wait to perform the surgery when she was stronger. There was a big chance that she wouldn't survive it or that she would bleed to death. Miraculously she did well, but a few days later, when she was ready to get the breathing tube out, they noticed her breathing was becoming difficult and required more help. Another CT and MRI revealed hemangiomas that were now compressing her airway. She was very close to getting a tracheotomy. The scans also showed hemangiomas in her neck spreading to her spine. We had a cardiologist, GI, hematologist, dermatologist and a hospitalist meet together. Elyse's life was now in danger. If the neck hemangiomas grew, that would leave her paralyzed. Every hemangioma detected was in or next to a major organ. It wasn't good. Thankfully, at least she was able to wean off the ventilator and was breathing on her own. We were given two treatment plans. The first was Interferon Alfa-2a and the second was Vincristine, a chemotherapy drug. Both had many side effects. Interferon is a drug mainly used to treat patients with Hepatitis C and Leukemia. They explained to us that this medication wasn't recommended for children under the age of one because there was a 20% chance of spastic diplegia, a form of cerebral palsy. Vincristine also has its share of side effects as a chemotherapy agent. The doctors, however, preferred the Infereron, even though Elyse was only three months old. They said we had to weigh the risks and benefits because of her condition and the rapid growth of the hemangiomas. We were terrified. The following day, we were taught to give daily subcutaneous injections. Elyse was on Interferon for three months when she started having other GI symptoms. Hemangiomas were once again growing. She was then switched to Vincristine and steroids. She had a Broviac central line placed the same day her G tube was placed. Elyse continued to receive MRI's and CTs every three months until she was a year old. Chemo and steroids were completely weaned off by December 2008. Elyse continues to have a yearly MRI of her head and spine, and CT scans of her chest and abdomen. The hemangiomas are now finally stable. Thankfully, we haven't had any changes. Her brain looks the same. The hemangiomas have shrunk and some dissolved. We continue to see many specialists and will continue to see them until we are sure that nothing is changing. Elyse had only been home a couple of times in her first year, with the longest time three weeks in December. During those three weeks, no one slept. I felt like a walking zombie. Up to then, I was expressing my breastmilk. Having her home, having a million doctor appointments, and working full time started to take a toll on me. I had to give up. I felt horrible. During one of Elyse's check-ups with the pediatrician, I had my husband explain to the doctor that we could no longer do this by ourselves. We needed help. Thankfully, this amazing doctor knew of a nursing program and she contacted the hospital and got us the information we needed for this program. Of course, it was something that took many months, but at the end, it allowed our daughter to stay home with us and give us the kind of help we desperately needed. Elyse's illness also affected my son, Alexander, who at the time was 10 years old. It broke my heart that he was at the cardiologist's office when our daughter was diagnosed with heart issues. He wasn't in the room, but when he came in, I was in such terrible shape that he immediately knew something was wrong and ran out of the room crying. I did get some help from the hospital's child life specialist to answer his questions. To make matters worse, we had just moved into a new house, our very first home, which meant a new school and a new neighborhood. As Elyse got sicker that summer, my husband and I made arrangements for Alex to stay with my parents, where we had been living prior to Elyse's birth. That way Alex could continue going to the same school, and my parents and sisters would give him the attention he needed. I know not everyone agreed with this, but my way of thinking was that Alex was healthy, but we just didn't know if Elyse was going to make it. I wanted to make sure I was there in case anything happen. After Elyse turned one and was more stable, Alex returned home, which did require adjusting to a new neighborhood and schools. Now he's 13 years old, in eighth grade, and we are able to give him more attention. Due to the costs associated with the new house, I had no choice but to return to work full-time, a bit early from my maternity. After work, I would go straight to the hospital and spend my evenings there. After the hospital, my husband and I would go over to my parent's house to see Alex. It was unbelievably hard on everyone. Due to the first surgery, Elyse suffers from vocal cord paralysis and reflux that led to the inability to hear our child cry. She also required use of a feeding tube instead of feeding by mouth. Developmentally Elyse was very behind due to spending so much time in the hospital. By the time she was one, she couldn't sit, roll or crawl. We immediately began therapy with Early Intervention, and by the time she was 15 months, Elyse was sitting and crawling. At 18 months, she started to learn to eat by mouth. At 23 months old, she walked. Now, at three years old, Elyse is a very happy and busy little girl who attends half-day preschool. I'm happy to say that after three years, she no longer requires her feeding tube and it is out. The reflux is finally controlled and does not require any more medication. She is now eating, even though she still requires help and continues to receive speech therapy. Because this condition is still so rare, there isn't much information that can tell us what will happen to Elyse as she gets older. We know that because of the arterial anomalies to her brain and neck, she will be at risk for stroke. She will continue to see cardiology and hopefully never require additional surgery. She sees an ophthalmologist twice a year to make sure her eyes are fine. Because of the hemangiomas in her airway, she now sees a pulmonary doctor who is treating her for her breathing issues. Our first year was very stressful and there were times in which we didn't know if our little girl would make it. We've done lots of worrying. We've learned many new terms. We learned to do procedures that parents should never even know about. We had an amazing group of doctors who did everything they could to keep her alive. I also had joined a support group for parents of PHACE Syndrome children. There were only seven of us. Three years later, we have about 82-100 members from all over the world. I don't know what I would have done without these women. They gave me so much support when others could not get it. It was nice to be able to communicate with other moms going through the same issues we were going through. Living with PHACE Syndrome has meant many heartaches and operations, but our delightful little girl makes it all worth it. Our Community strives to raise awareness and support research and fundraising campaigns aimed at the treatment of PHACE Syndrome and Vascular Anomalies. We are made up of a team of volunteer parents which serve as community coordinators and advocates. The National Organization of Vascular Anomalies is a patient support, advocacy and educational agency for those affected by hemangioma, vascular malformation, rare benign tumors and many related syndromes. Traditionally these tumors and malformations have been called birthmarks. Medicine and science today dictate that they are so much more. A Private support forum for families living with PHACE Syndrome, sometimes referred to as PHACES Syndrome and PHACES Association. Frieden IJ, Reese V, Cohen D. PHACE syndrome. The association of posterior fossa brain malformations, hemangiomas, arterial anomalies, coarctation of the aorta and cardiac defects, and eye abnormalities. Arch Dermatol 1996;132(3):307-11. Metry DW, Dowd CF, Barkovich AJ, Frieden IJ. The many faces of PHACE syndrome.